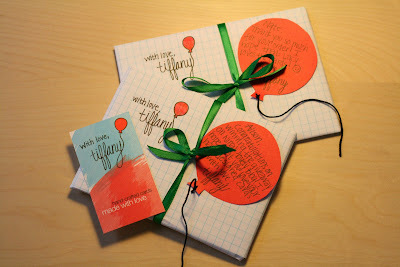 Tiffany Zajas Photography: i heart packaging. My "day job" has kept me pretty busy lately, so I haven't had a ton of time to make new items for my etsy shop. But I have had a few orders each week, and thoroughly enjoy having the chance to make custom cards for people and send them little packages in the mail. I have a love for beautiful packaging. 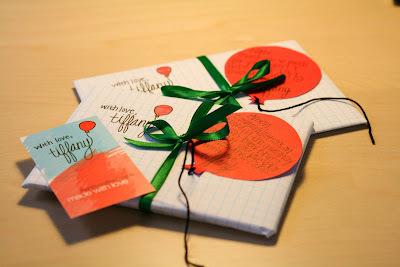 I love paper, and ribbon, and hand written notes...they all make me very happy. i enjoy mail too-- but i'm not nearly patient enough to create something that beautiful! Mine's in the picture! I'll be honest, I opened the package very carefully and carefully put it all back together. It's too awesome to let it go to waste. Tiffany, I found you on Twitter and just read a couple of your blogs. I really enjoyed the happy, upbeat tone of the blogs about you and your husband's life. Will be back to read more later.